How are the EU member states doing on gender equality? Earlier this week, I was very fortunate to attend the Gender Equality Index 2017 conference. 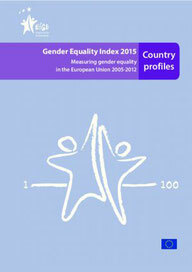 The Gender Equality Index is a tool to measure the progress of gender equality in the EU, developed by the European Institute for Gender Equality (EIGE). The Index has six core domains - work, money, knowledge, time, power and health – and two satellite domains: violence against women and intersecting inequalities. It gives more visibility to areas that need improvement and ultimately supports policy makers to design more effective gender equality measures. The results are updated and revealed every two years at an international conference. Since the last index, the score has improved 4 points and now lies at 66.2 points out of 100. The top performing country is Sweden with a score of 82.6, while Greece moved to the bottom with 50 points. Italy recorded the biggest improvement. Overall, although the majority of Member States improved their overall scores from 2005 to now, nearly two thirds of them fall below the EU-28 average score. A few things struck me as particularly noteworthy. First of all, progress is way too slow. We cannot afford to miss out on women’s skills in the workplace for the next decades, and cannot afford men to suffer from the health consequences of toxic masculinity, either. We need to do better as soon as possible. Second, we often assume that we are continuously moving forwards. Sadly, we cannot take this for granted. In fact, some of the scores decreased during the past 2 years. We will only make progress if we constantly push for the cause. And finally, I was struck by low scores in some of the economically strong member states who are often praised for their well-functioning politics. Specifically, my own country Germany scored disappointingly low on a number of dimensions. As Ghandi put it, “The true measure of any society can be found in how it treats its most vulnerable members.” Let us raise all countries to higher standards, and let us no longer accept that a society functions well only for half of the population. When I think back of the conference now, a few days later, I do not think of specific country scores, however. The most impressive part of the day was the wealth of amazing feminists from all over Europe -men and women- gathered in one room. I felt truly inspired by many of the speakers: Among others, Åsa Regnér, Swedish Minister for Children, the Elderly and Gender Equality, who stated that we owe little girls that they will have the same chances as boys, and Tiina Astola, Director-General, Directorate-General for Justice, Consumers and Gender Equality at the European Commission, who pointed out that gender equality is not necessarily a linear process. And finally, Frans Timmermans, First Vice President at the European Commission, who closed the conference with a fantastic speech full of determination and encouragement to create a better future – an excellent example of a male ally. The speakers agreed that gender equality will be achieved through political decisions, allocation of resources, and a constant fight in public debates. With an audience just as knowledgeable as the speakers, interesting discussions unfolded throughout the day. Despite some of the sobering statistics, I left the event feeling inspired and determined to contribute towards better statistics for the Gender Equality Index 2019 – the process begins now.